In The Taken King, some Exotic weapons are still yet to be discovered. Building off of the concept of Exotic Bounties from Year 1, Exotics can now be found after completing elaborate quests that offer more difficult challenges and glimpses into the lore that surrounds Destiny. DEAD EYE – Bonus to range, stability, and movement speed when aiming down sights. 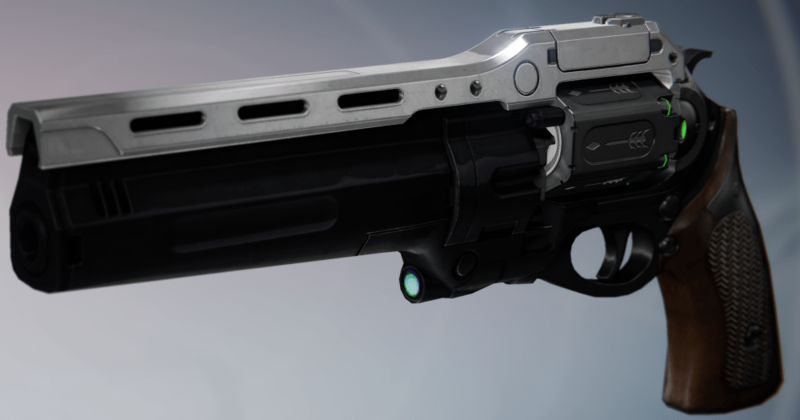 THE FIRST CURSE – Precision kills while aiming down sights grant increased range and stability until the next reload. Exotic Swords, Black Spindle, The Chaperone, and Touch of Malice also have Exotic Quests. 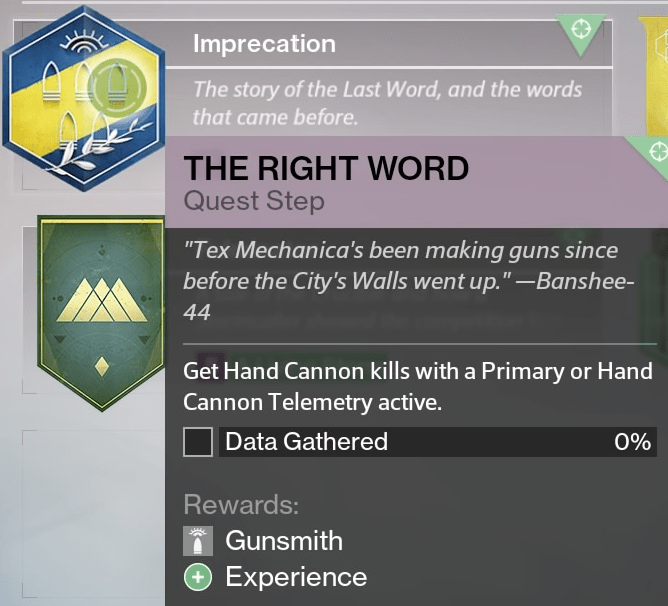 The only way to begin the quest for The First Curse is to reach a rank 5 with Banshee-44, the Tower Gunsmith. 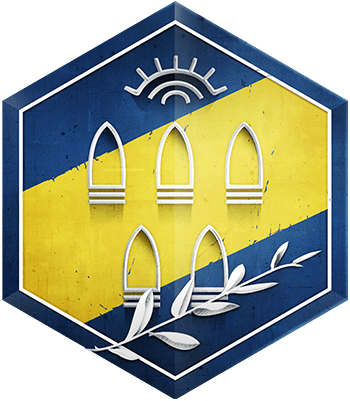 Some players have reached this high rank already, though many have yet to come close. The best way to make progress in rank is to complete all weapon testing each week. Once you hit rank 5, Banshee with offer you the quest known as “Imprecation” and your search will start. Get Hand Cannon kills with a Primary or Hand Cannon Telemetry active. First up, you’re going to need to kill some baddies with active telemetry. If you’ve got some hand cannon telemetry in the vault, feel free to use it. Otherwise, primary telemetry is available at the Gunsmith for an affordable price. Where you get the kills doesn’t matter, so any PvE or PvP activity will do. Speak to Banshee-44 at the Tower Watch in the Tower. Head on back to Banshee and have a chat – it seems like he’s had a long relationship with the Tex Mechanica foundry. Wait for Tex Mechanica’s next Armsday delivery. Armsday occurs every Wednesday. Now the boring part… you’ll have to sit and wait until the next Armsday in order to keep moving forward with the quest. This seems to be a new trend with The Taken King, considering the Chaperone and Sword quests both included waiting periods. At least this prolongs the excitement of the new expansion! It’s Wednesday! Go have a chat with the Gunsmith again. Sounds like Banshee remembers the time when Exotic hand cannons reigned supreme. He’ll reward you with Imprecation, and now you can put it to good use. This battle will test a Guardian’s will and determine if they live up to the Guardians who once fought to defend the City before there was a wall. Getting kills in the Crucible is another story. Any time you venture into the Crucible, it’s recommended that you bring a fireteam. Having teammates you can communicate with gives you an immediate advantage, and callouts will allow you to track your foes without even seeing them. Make sure to avoid charging forward into a room, and remember what distance you fight from. Equipping a shotgun from too far out can end a spree easily. Always try to put the fight in front of you, but keep your head on a swivel for flanks and sneak attacks. The streaks will come with the right amount of patience and discipline (not the grenade kind, but that will help too). Return to the Gunsmith with your updated Imprecation. Tex Mechanica has plans to rebuild The First Curse using reverse engineering! People always forget about the other one. The first one. They remember its twin, the Last Word, because that’s an easier story to tell. But it’s not the whole story. You’ve put in hard work and waited long enough, so now it’s time you’re awarded the new Exotic hand cannon you deserve. The yin to The Last Word’s yang, The First Curse rewards precision kills from a skilled shooter. Only you will be able to decide if it stacks up to the Year 1 favorite. The quest will be challenging for those who aren’t fond of the Crucible, but the reward will be worth the battle. Tex Mechanica’s role in providing Guardians with the ultimate tools of war seems to be expanding – we can’t wait to see what they bring us next!